When fighting cancer, you are never alone. 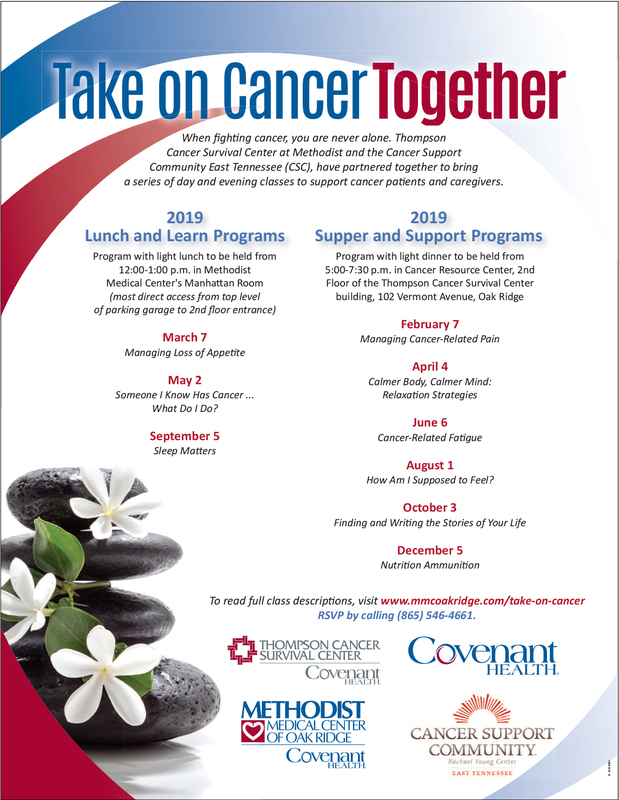 The Cancer Resource Center of Methodist’s Thompson Cancer Survival Center and Cancer Support Community East Tennessee (CSC), have partnered together to bring a series of day and evening classes to support cancer patients and caregivers for 2019. Program with light dinner to be held from 5:00-7:30 p.m. in Cancer Resource Center, 2nd Floor of the Thompson Cancer Survival Center building, 102 Vermont Avenue, Oak Ridge. Cancer or its treatment can cause pain. Our interdisciplinary panel– made up of a physical therapist and psychologist — will help you to understand your pain cycle and then learn practical tools to manage your pain and improve your quality of life. Denise Stillman, PhD, behavioral psychologist, will talk to you about your body’s response to stress and teach relaxation exercises to calm your body and mind. Fatigue is one of the most common and frustrating symptoms associated with cancer and its treatment. Our interdisciplinary panel — made up of a nurse, physical therapist, and psychologist — will explain cancer-related fatigue and strategies for managing it. August 1 How am I Supposed to Feel? Debra Sullivan, PhD, psychologist at CSC, talks about the signs of depression and anxiety. She will help you understand the emotional roller coaster that comes with cancer, and help you find ways to maintain emotional balance — and even cultivate joy — during this challenging time. By looking at the big story of our life, we often miss the little stories that make up a year, a month, a day, or even an hour. CSC’s creative and inspiring writing instructor, Donna Doyle, will help you uncover and find ways to tell those precious stories. No writing experience necessary! Healthy food choices can be difficult, especially during the holidays. Our Registered Dietician will offer 10 tips for maximizing nutrition during and after cancer — all while enjoying a tasty and healthful sampling menu. Program with light lunch to be held from 12:00-1:00 p.m. in Methodist Medical Center’s Manhattan Room. Most direct access from top level of parking garage to 2nd floor entrance. What do I do if I don’t feel like eating? Join members of our nursing and nutrition staff as they offer tips for managing loss of appetite and getting the basic nutrition needed to help tolerate treatment and fight cancer. Lots of samples will be available for tasting. May 2 Someone I Know Has Cancer. What Do I Do? Most people know someone who has cancer, and many are unsure how to help, what to say (or not to say), and, in general, what to do. Join nursing staff and CSC’s psychologist, Denise Stillman, Ph.D., as they discuss some do’s and don’ts in supporting someone with cancer. Having trouble falling or staying asleep? For those impacted by cancer, the effects of treatment and medications, along with the stress of cancer, may keep you and your loved ones from getting a good night’s rest. CSC’s psychologist, Denise Stillman, Ph.D., will discuss why sleep matters and what steps you can take to improve the quality of your zzz’s.